A temple with the god of good matchmaking in the historic atmosphere of Osaka’s temple district. Shoman-in Temple, known as Aizen-do「愛染堂」 is located on the Uemachi plateau in Osaka. This area has a history as a temple district “Tera-machi” with about a hundred of historic shrines and temples, spreads over 1,400 meters from north to south and 400 meters from west to east. Many of them date back hundreds or even a thousand years, such as Shitenno-ji Temple, Ikutama Shrine, and Kozu Shrine. Aizen-do dates back to 593, when Prince Shotoku first built Shitenno-ji Temple. He also built seven shrines to protect Shitenno-ji, called Shichi-Gu , along with four additional temples. One of them, Aizen-do Temple was built to grow medicinal plants and help the sick. 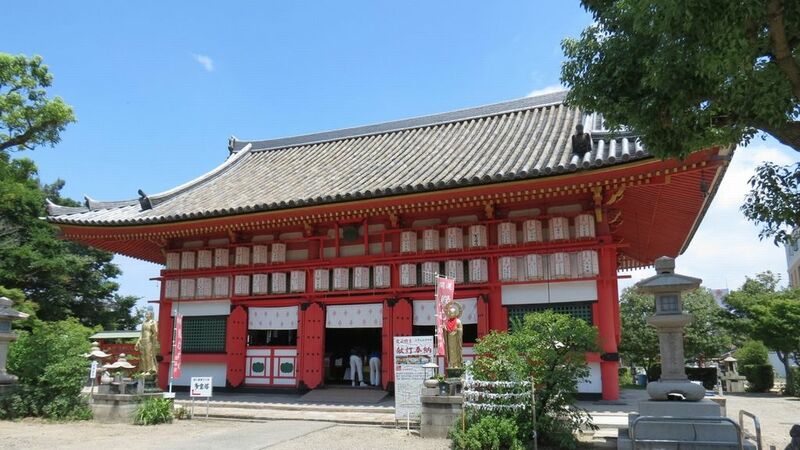 The temple gradually became more popular for its deity, Aizen Myouou, the god of good matchmaking and happy marriage. The main hall enshrines Aizen Myouou. It can be seen on special occasions such as Aizen Matsuri Festival or the new year day. The most important property on the precinct is the pagoda “Taho-to”. This pagoda is the oldest building in Osaka city. The current pagoda is rebuilt by the well known warlord, Toyotomi Hideyoshi in 1597. Since then, the pagoda has remained intact over hundreds of years. The pagoda enshrines a statue of a very rare 12-armed Buddha called Dainichi-Daishou-Kongo-Son. The statue was enshrined in the pagoda by order of Hideyoshi. Throughout most of the year, the pagoda is tightly closed and only open during Aizen matsuri festival. On the temple’s grounds, there is a katsura tree with chinese trumpet vines drape around it, called “Aizen Katsura”. People think the way the vines drape around the tree is suggestive of a lovers’ cuddle. The tree is therefore a symbol of matchmaking. Another matchmaking spot in Aizen-do is a small well, called “Aizome no Reisui”. It’s believed that you can find true love if you drink this spiritual water from the well. Aizen-do is not quite famous, however people in Osaka know Aizen Matsuri Festival, the oldest summer festival in Osaka. The festival takes place from June 30 to July 2 every year. Along with Tenjin Matsuri and Sumiyoshi Matsuri, Aizen Matsuri is one of the three big Osaka festivals. It also known as the first major summer festival in Osaka of the year. The highlight of the festival is the Hoekago Parade with beautiful young women carried aloft in a basket. “Hoekago” literally means “blessed treasure basket”.